The ACM International Systems and Storage Conference (SYSTOR) is an international forum for interaction across the systems research community. The program includes innovative, peer-reviewed research papers in the broad area of systems and storage, as well as distinguished keynote lecturers, a poster session, and social events. ACM SYSTOR is designed to appeal to academic and industrial researchers and practitioners, welcoming both students and seasoned professionals. A list of Program Committee members can be found here. SYSTOR accepts both full-length and short papers. A short paper is intended for an idea that can be described and evaluated in fewer pages; the goal of the short paper is not for preliminary work or workshop-style position papers. A good SYSTOR paper should present a novel, compelling solution to a well-motivated problem. The evaluation should demonstrate the strengths and weaknesses of the solution in settings that are as realistic as possible, including test applications workloads, system parameters, and assumed constraints. Authors should clearly describe their contribution in the context of prior work, and draw meaningful conclusions from their work. The program committee also encourages submissions that describe lessons learned from operational (especially large-scale) system deployments. Such submissions are expected to include sufficient details of the system, its design goals, and the methods used for evaluating whether these goals were met. The program committee will value submissions accompanied by supplemental material such as traces and open-source code that can help reproduce the reported results, and advance additional research in the field. A small set of outstanding papers will be forwarded to a suitable journal, such as ACM journal Transactions on Storage (TOS), for a fast-tracked review process for an expanded version of the paper. The highlights track gives an opportunity for research, previously published in a top-tier conference (e.g., SOSP, OSDI, FAST, ASPLOS, EuroSys, ATC, NSDI), to reach a broader audience with a second presentation (similar to ATC’s “Best of the Rest” track). Highlight papers will have a slot in the conference program for an author of the paper to present the work, but will not be republished in the conference proceedings in the ACM Digital Library. SYSTOR also welcomes academic and industrial posters. See "Call for Papers" above for foci and relevant areas. A good poster submission will articulate and motivate an interesting problem, and describe a new insight or approach to addressing this problem. It will clearly present the work in progress (or attained results), and the expected outcomes from future work. The poster should present these details in a manner that is clear and captivating. Poster submissions should include a one-page extended abstract, and a draft of the poster. The extended abstracts of accepted posters will be included in the online conference proceedings in the ACM Digital Library. 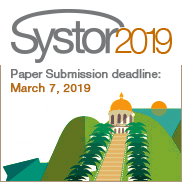 SYSTOR ‘19 will provide a unique opportunity for students to present their work to the broad systems and storage community. Students are encouraged to present research findings in a session co-located with the poster session. Submissions should include a draft of a poster reflecting the approach and main results, and a 1-paragraph abstract outlining the main presentation points (not to be included in the online conference proceedings in the ACM Digital Library). The program committee will review submissions in a single-blind manner (i.e., submissions are not anonymous), soliciting external reviews as needed. Any submissions accompanied by a non-disclosure agreement will be returned without review. By submitting a paper, you agree that at least one author will attend the conference to present the work. SYSTOR will enforce ACM’s Plagiarism policy regarding copying and resubmission of prior work. Simultaneous submissions are not allowed: any work submitted to SYSTOR must not be under consideration for another workshop, conference, or journal. AUTHORS TAKE NOTE: The official publication date is the earlier of either the first day of the conference or the date the proceedings are made available in the ACM Digital Library. This date may be up to two weeks prior to the first day of your conference. The official publication date affects the deadline for any patent filings related to published work. Papers should be submitted electronically as a PDF. All text and figures must fit within a 7”x9” text block, centered on the page, using two columns with .33 inches of separation. The paper should be typeset using a 10-point font (Times New Roman or similar) with a 12-point (single-spaced) leading. For the Full and Short Paper Tracks, please follow paper formatting instructions. The author kit, which contains the Latex style and template, is available here. For the Posters Track, please follow poster formatting instructions. The author kit, which contains the Latex style and template, is available here. Please ensure that your paper satisfies all the above requirements for content and formatting before submission; if you have a question about any of these issues, please send email to the program chairs, Ashvin Goel and Adam Morrison using this email: systor19chairs@systor.org. Additional instructions regarding camera-ready versions of accepted papers and posters will be sent directly to the corresponding authors and will appear here after the notification to authors.